As the 75th anniversary of D-Day nears, there will no doubt be a spate of new books on the most important amphibious operation of World War II. 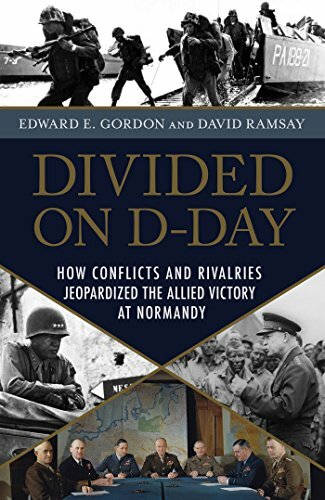 No doubt many of them, like this volume, will adopt a critical revision to many of the long-held assumptions about the Normandy Campaign—why did the Allies take so long to break out of the beachhead? Why wasn’t the encirclement battle at Falaise more of a victory? Could the Allies have won the war in 1944, avoiding another six or more months of casualties? The authors take a stern look at the Allied command structure, personalities, and decisions during those critical months from June to August 1944. Virtually none of the major Allied commanders is immune to critique, and the authors lay out their case with compelling and unstinting force. General (later Field Marshal) Bernard Montgomery receives the lion’s share of the author’s criticism and although many of his decisions have been critiqued by other historians, these authors lay out a more concerted case for Montgomery’s responsibility for the failure of the Allied armies to achieve a more decisive victory and perhaps end the war earlier. Montgomery’s ego, jealous of what he felt was his right to command the ground war instead of Eisenhower, and his overall cautious nature are laid bare in this book, beginning with the failure of the British forces to seize the critical city of Caen on D-Day, to the inability of British forces to press the attacks to break through the German forces to, most incredibly, Monty’s ability to change the narrative of the battle to maintain his image and status as Britain’s premier general of the war. Unfortunately, Dwight Eisenhower comes out little better. Although the authors acknowledge his superb capability as the Supreme Allied Commander to keep together a fractious coalition led by many strong egotistical generals, at critical moments his loose and often advisory command style allowed Montgomery to run his own battle plans rather than adhere to an overall allied plan. In particular, the challenge Eisenhower had with directly ordering Montgomery to capture and clear the approaches to Antwerp, a critical port needed by the Allies, led to not only the disastrous Operation Market Garden, but kept the port unavailable to the allies for nearly 60 critical days in the fall of 1944. At times the reader is left to wonder if the Allies didn’t win the war as much as the Germans lost it by having an even more convoluted command structure that began at its apex, Adolf Hitler, who assumed operational control of matters that were best left to his front-line commanders, including the crucial question of when to commit Germany’s panzer reserves to counter-attack the anticipated Allied landings. The authors make their own conclusions that if General Patton’s 3rd Army and allied forces on the southern wing of the Allied advance had been given supply and support priority in August 1944 when the German Army had nearly collapsed, it is likely that Germany could have been invaded and the Rhine River crossed before winter, perhaps hastening the end of the war and preventing the bloody Ardennes Offensive of December 1944. The reader can draw their own conclusions of whether the authors are correct in their assessment. What is irrefutable is that while the Allies inflicted a massive defeat on the German Army in France in 1944, the victory was not as decisive as it could have been due to not only the long chronicled supply problems encountered as they raced toward Germany, but serious command problems exacerbated by national rivalries, personal animosities, and a command style that often favored consensus and political subtleties over military necessity. For anyone who has studied the Normandy Campaign, the book offers an excellent synthesis and new insights not previously considered on Allied strategy and operational planning based on the personalities and interactions of the commanders who made them.